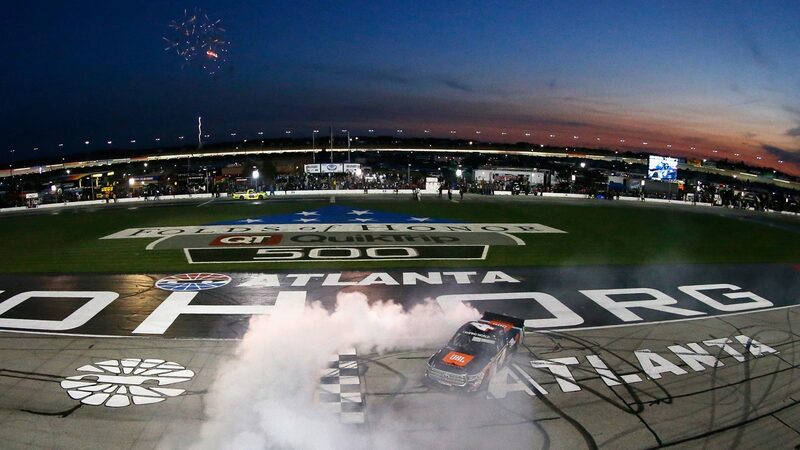 NASCAR will continue the 2018 season with a trip to Henry County, Georgia for a triple header at Atlanta Motor Speedway. NASCAR Camping World Truck Series, Xfinity Series and Monster Energy NASCAR Cup will all race this weekend. Atlanta Motor Speedway, formerly Atlanta International Raceway, opened for racing in 1960 (rebuilt in 1997). The track is a quad-oval and is 2.48 km (1.54 mile) long. Surface is asphalt with four turns. Banking in turns; 24°,straights; 5°. Track record, for NASCAR Series, is held by Geoffrey Bodine with 197.478 mph (28.074 sec.) in November 15, 1997. Bonus fact: The oldest NASCAR race winner at Atlanta Motor Speedway is Morgan Shepherd at age 51 (March 20, 1993). The stands currently capacity are 75 000 seats.